First State Contractors in Hockessin, Delaware, a third-generation family-owned company, takes great pride in our over 50 years of experience in all aspects of commercial and residential construction. We are proud of our years of experience, in addition to our being licensed and bonded. We have the team especially experienced to assist in creating your dream addition or remodeling of your outside living space. 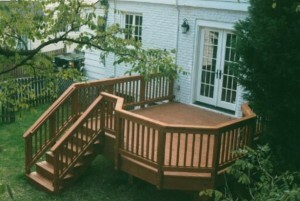 More and more decks provide additional living space and value to your home. Our experience with not only decks, but also sun-room and patio construction or remodeling will take your dreams to a reality. As an environmentally responsible company, we only use the best construction materials. Materials used include polymer stabilized wood, vinyl decking and custom stamped concrete. We are able to customize your vision using one or more materials. We use Ecolife decks that are known for their reliable performance not to decay or have termites. These decks are so reliable that each deck is provided with a lifetime warranty. We use Gorilla Decks for our vinyl decks. Vinyl decks are easy to clean and are almost maintenance free. Our team will work hand in hand with you through the entire process, from choosing materials that best fit your needs and wants, all to ensure that your new addition will provide you with years of enjoyment and benefit to you and your property. We assist you in creating your outside living space all within your budget. For a free consultation, please feel free to email or call us.